One person’s invader is another person’s honored guest. 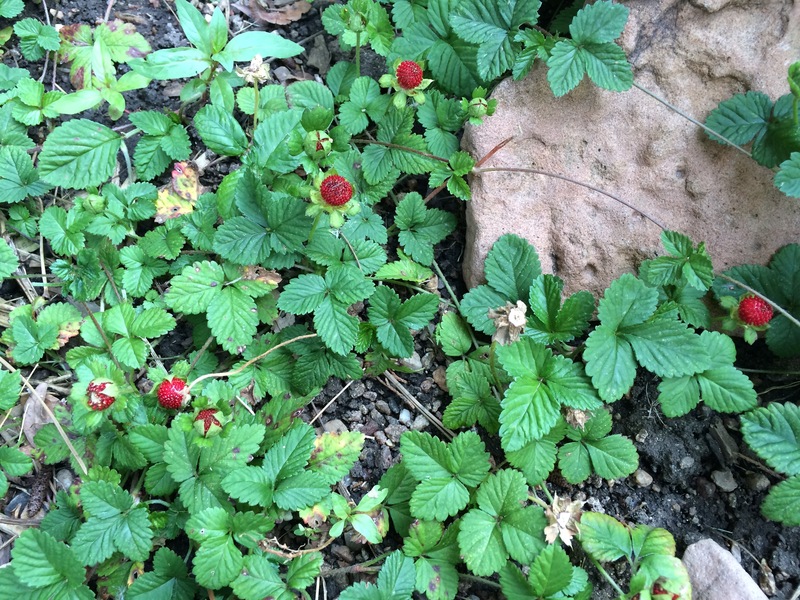 A friend of mine wages war against the rangy “mountain strawberry” plant that creeps into her Colorado lawn every summer. Despite the cute little berries, she considers this native plant an invasive pest and she works hard to eradicate it from her garden. Pesky weed or delightful delicacy? That afternoon, Sandy’s gardener harvested a cup or two of the precious berries. I made Sandy’s “best-ever” shortcake recipe, and she whipped up her special version of fresh whipped cream (secret ingredient: sour cream). 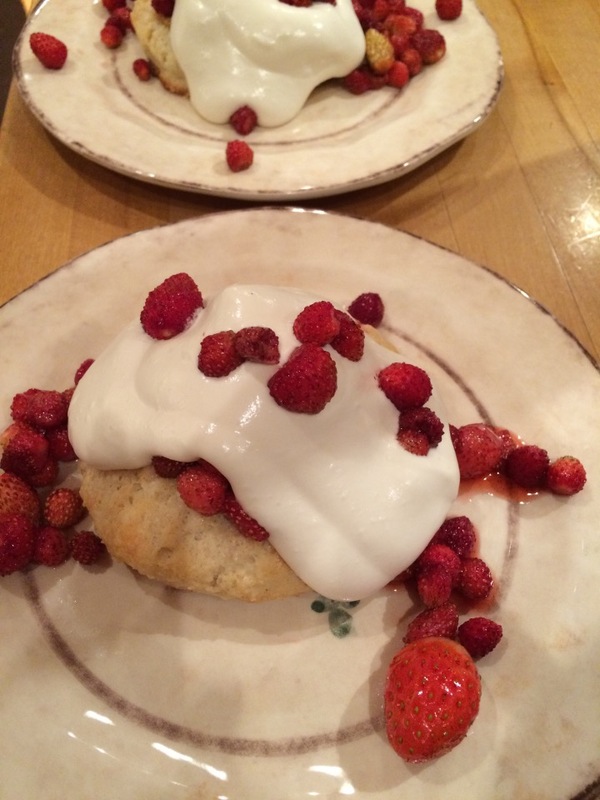 That night for dessert, we feasted on Mountain Strawberry Shortcake. Position rack in center of oven and preheat to 400 degrees. Line a rimmed baking sheet with parchment paper. Whisk flour, 7 tablespoons sugar, baking powder, salt, and nutmeg in a large bowl to blend. Add butter and rub in with fingertips until mixture resembles coarse meal (do not overwork or dough will be tough). Gradually add buttermilk, tossing with a fork until moist clumps form. Gather dough together; flatten dough on a floured work surface to 3/4- to 1-inch-thick round. Using a floured 3-inch round biscuit cutter or cookie cutter, cut out rounds. Gather dough scraps and flatten on work surface to 3/4- to 1-inch thickness; cut out additional rounds for a total of 8. Transfer shortcakes to prepared baking sheet. Note: Recipe can be easily doubled; for variation and to enhance different fruits, swap Grand Marnier or other fruit liqueur for the vanilla. Put it all together: Top the warm shortcakes with a big dollop of whipped cream and as many fresh berries as you like. Just about any kind of luscious summer fruit will work; try it with regular strawberries, raspberries, blackberries, peaches, or plums. I’m psyched that a piece I wrote for Sunset magazine’s blog is now on the site! Titled “Why you can’t trust every recipe on the internet,” it’s a lighthearted look at a common problem — published recipes that may or may not work in a real kitchen — plus tips on what you can do about it. I’m afraid the answer is yes. Needless to say, this can be frustrating and costly for the home cook, so I hope the blog gives you some useful guidelines in your own recipe adventures. And please leave a comment about recipe sites or publications that you particularly trust. I can say from experience that Delicious Living and Sunset are both excellent sources. It started with the chocolate souffles. No, that’s wrong. 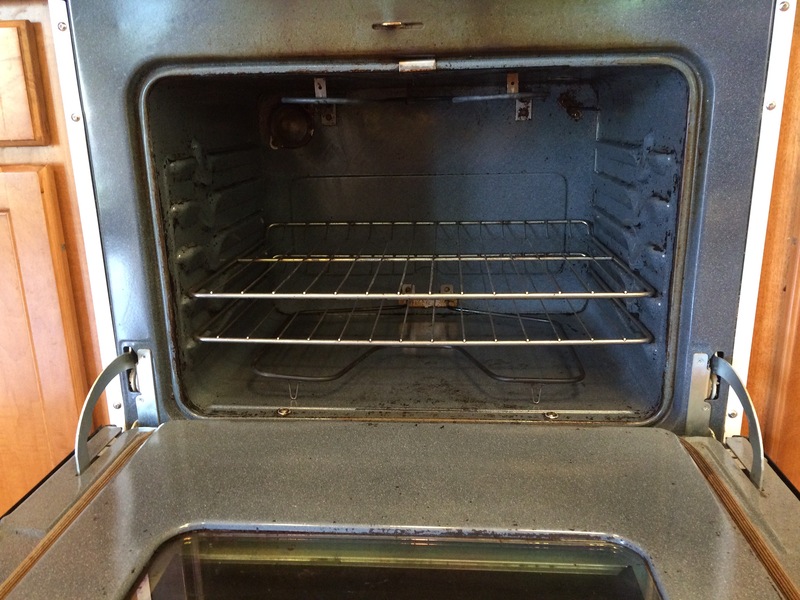 It started about 16 years ago when we moved into our house and I noticed that our oven could use a cleaning. Didn’t do it. During the years of family cooking and recipe testing, the oven’s entire interior eventually turned solid black (roast chicken is my favorite dinner). A couple of years ago, I noticed that every time I cooked something at 425 degrees or higher, the oven smoked fiercely, filling the house with gray haze and setting off the smoke alarms. Because I mostly roast foods during winter, opening the doors and windows in sub-freezing temperatures became problematic. Still, I couldn’t bring myself to clean it. I hate caustic chemical cleaners and, given the 1/8-inch-thick layer of black grime, it seemed impossible to clean without going nuclear. What about the self-cleaning function? 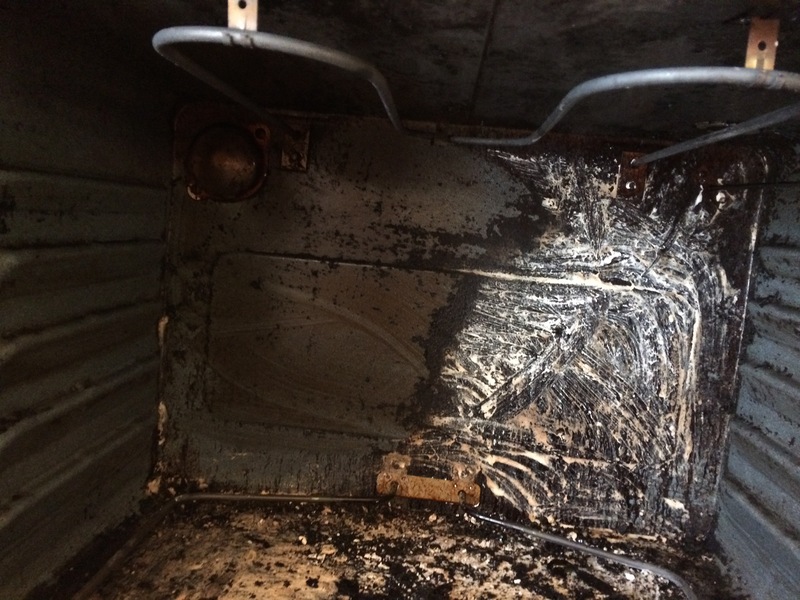 According to our appliance repairman, employing that feature in old ovens like ours often makes the door seal shut — permanently. So it stayed black. And anyway, what’s a little smoke among friends when roast chicken is on the menu? But then, last week, I made Dave’s favorite dessert — Bittersweet Molten Chocolate Cakes — for his birthday. These wonderful treats cook at 425 degrees … uh-oh. 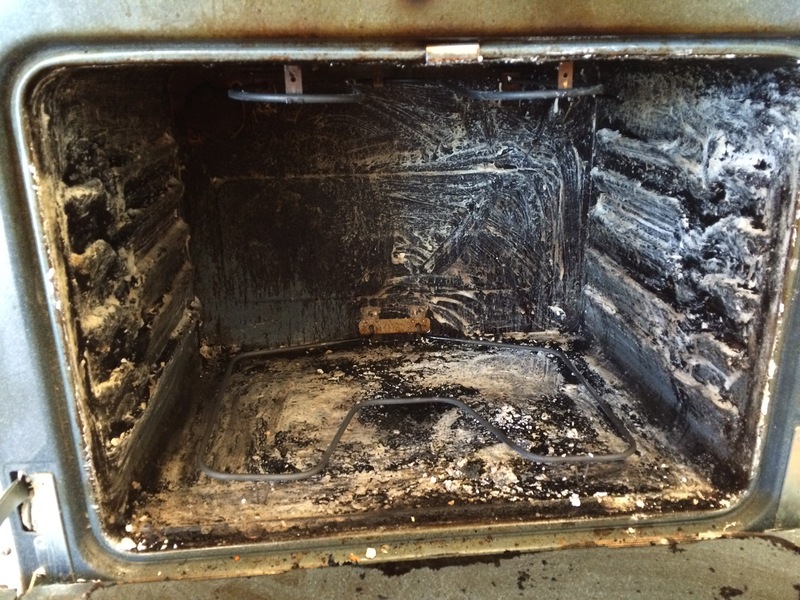 Sure enough, when I opened the oven to remove the mini souffles, smoke billowed out. And when we ate those special-occasion treats, warm and topped with Talenti gelato, I tasted it: unmistakable, unpleasant, greasy smoke. Smoky roast chicken, fine. Mess with my chocolate? Now we have a problem. 1. Make a paste with baking soda and water. One-half cup was not nearly enough; I used about 1 1/4 cups baking soda and about 7 tablespoons water. 2. Remove the racks (The Kitchn blog tells how to clean those, too). Smear the paste on every single interior oven surface except the heating elements. Close the oven and let it sit undisturbed for at least 24 hours. 3. Arm yourself with a sturdy washcloth that you don’t mind ruining, along with a bucket of very warm water. Wipe the oven surfaces — repeatedly — with the warm, damp washcloth to remove the grime. Rinse out the washcloth often (I must have changed the water about 20 times). I also placed an old towel lengthwise on the floor under the oven door, and I’m glad I did; it caught a lot of the accumulated gunk. 4. Once it’s all wiped out, lightly spray inside the oven with plain white vinegar to activate any remaining baking soda, and wipe clean again with a damp cloth. Done. I had my doubts … but it worked! I forgot to take a full “before” picture (still not used to the blog mentality), but here you can see my initial wipe off of the oven door. Especially on the flat surfaces, the built-up layer really did wipe right off. After the easy parts came off, that’s when the elbow grease came into play. 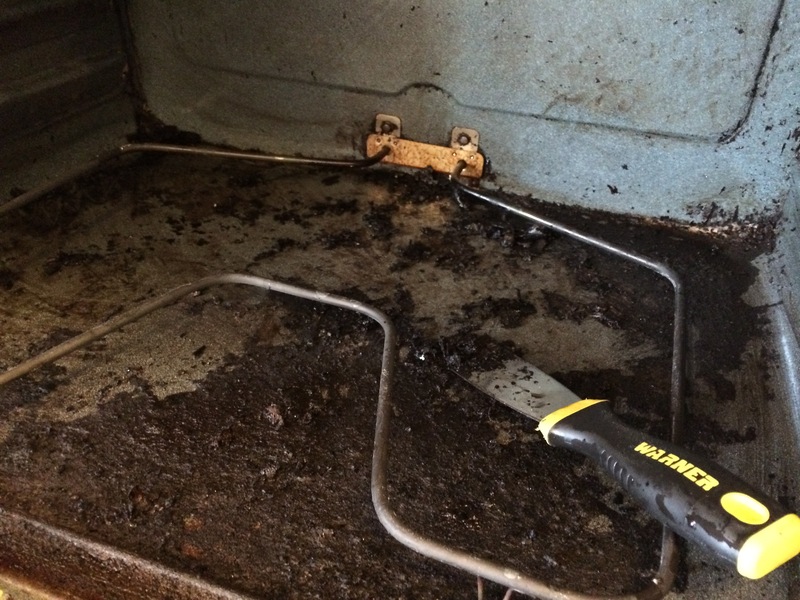 The blog warned that harder spots might need more scrubbing or even scraping. True that: I worked for about 2 hours scrubbing and scraping the hard-to-dislodge grime. I also used a flexible spackling tool to scrape some spots. It did not scratch the enamel, but use caution with your own oven; a firm plastic spatula might be safer. 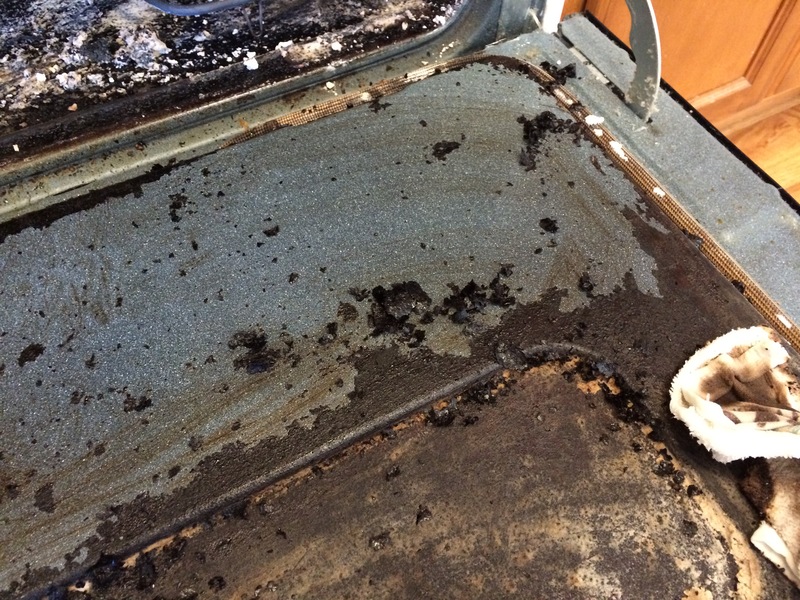 In this photo you can really see just how thick my oven’s grime layer was. I wasn’t going for perfection — as long as it no longer smokes, I don’t care about a few black spots — and I was extremely pleased, not to mention astonished, with the final result. 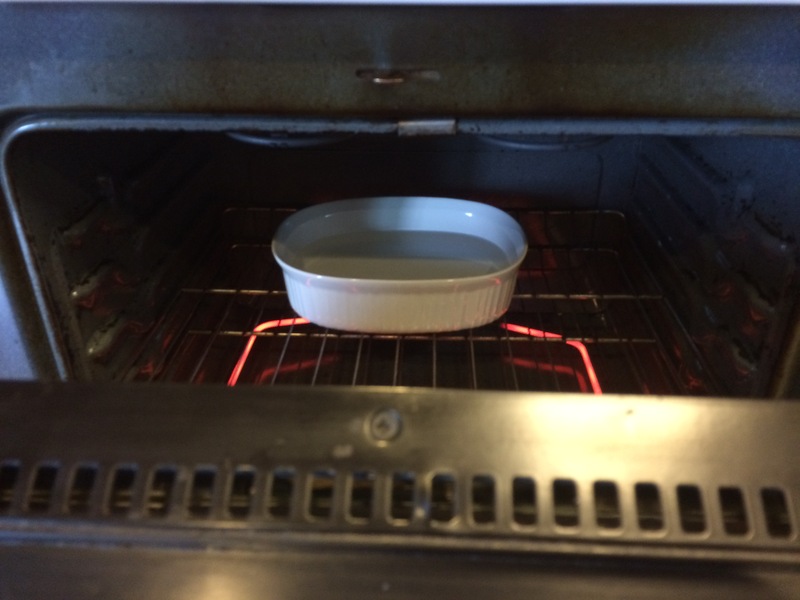 Before cooking anything, I decided to “roast” a pan of water at 425 degrees, just to be sure any lingering baking soda or vinegar smell didn’t infuse something I wanted to eat. A few scraps of grime landed in the water while it roasted, so I was glad I did it. Takeaway: This all-natural technique worked beautifully on my lost-cause oven. There’s no need to use scary-harsh chemicals, even with the most awful, baked-on oven grime you can imagine. Now I’ve got yet another reason to eat more chocolate. Did you know that the ancient Greeks had a word for celiac disease? Or that research indicates gluten might not be the only culprit for millions of people with gluten sensitivity? Or that treatments beyond a gluten-free diet might be on the horizon? Several people have asked me for a review of that talk, so here it is, along with my slides. Yesterday my colleague Allison told me that this gallery of 10 surprising gluten-containing foods that I created for DeliciousLiving.com somehow had a viral moment and got more than 10,000 page views! That’s the Internet for you; things live on (whether you want them to or not). The idea for this gallery originated from a blog I wrote a while back about my son’s experience with gluten in sushi, which was a complete shock to me at the time. Have you discovered other sneaky gluteny foods? Let me know! Time to get busy! There’s nothing like good food to light a fire in your heart (not to mention your kitchen). I created this gallery of passion-inducing foods on DeliciousLiving.com; check them out and add your own ideas for stirring up trouble this Valentine’s Day. I am the first to admit that I am not a happy baker. But when I saw this January 2015 cover of Sunset magazine, I felt an irresistible urge. I had to make this Corn Flour and Orange Blossom Chiffon Cake.